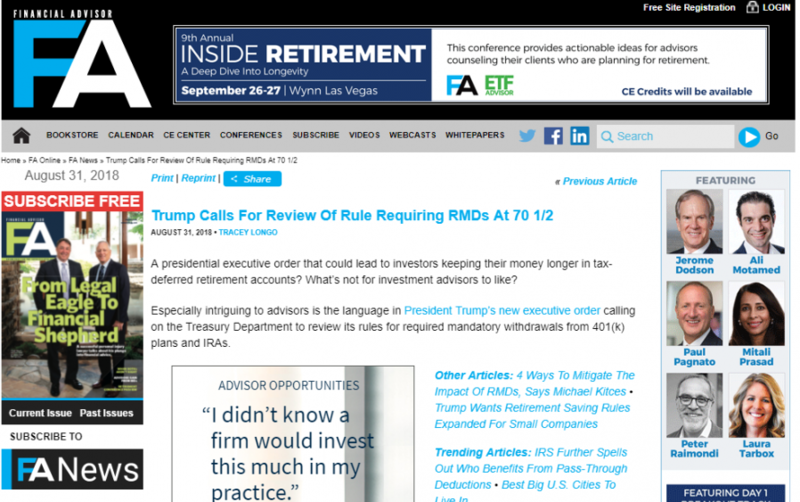 A presidential executive order that could lead to investors keeping their money longer in tax-deferred retirement accounts? What’s not for investment advisors to like? Especially intriguing to advisors is the language in President Trump’s new executive order calling on the Treasury Department to review its rules for required mandatory withdrawals from 401(k) plans and IRAs. Generally, investors must start withdrawing funds from these accounts when they turn 70-and-a-half. Allowing investors to stay invested longer also preserves the assets under management advisors manage and AUM fees they charge.